Are people in wealthier countries happier than those in poorer nations? The list of happiness ratings below was collected from the World Database of Happiness, which compiles data on happiness studies from all over the world. These ratings apply to the years 2000 to 2008. The information on each country’s income was gathered from the CIA World Fact Book. 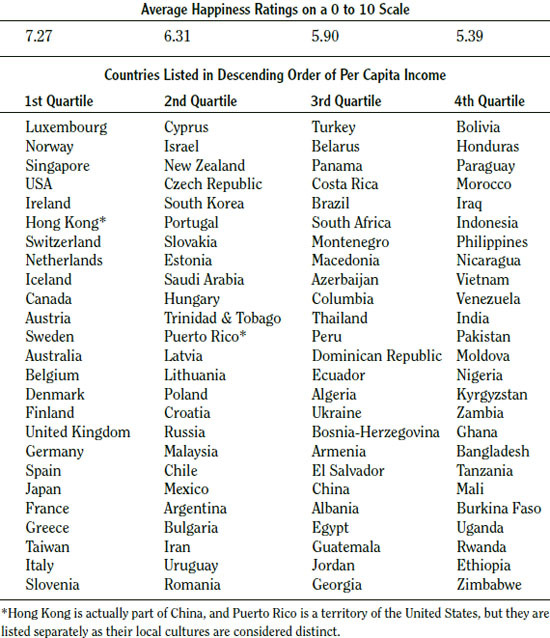 Per capita income refers to the average income of each country’s citizens. As we can see from the table, the average happiness ratings, which range from 0 (least happy) to 10 (most happy), vary across the four income quartiles. On average, wealthy countries have higher happiness ratings.